Interface Bandwidth, kbit/s – specifies the target network interface bandwidth. A WMI query used to get an Interface Name also returns the nominal interface bandwidth used as the default Interface Bandwidth value. The value can be set manually, and the default value can be changed if the actual network bandwidth is smaller than the nominal interface bandwidth. The and show it as parameter shown above specifies units to measure the traffic speed. The units can be set via the drop-down menu. The default is bandwidth percentage. The others are kbit/s and Mbit/s. Note: Speed Limits can be set on the monitor State conditions tab. A monitor will switch to a problem state (Warning or Down) after the traffic speed exceeds these limits. By default, no limits are set. 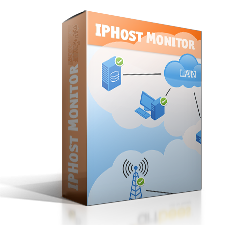 The Interface Name and Interface Bandwidth, kbit/s parameters have the same meaning as defined for the WMI Traffic Speed Monitor. The and show it as parameter specifies units to measure the traffic volume. The units can be set via the drop-down menu. The default unit is kbytes. Thr others are Mbytes and Gbytes. If this parameter is changed, then the collected Traffic Volume value will change accordingly. Note: Volume Limits can be set on the monitor State conditions tab. A monitor will switch to a problem state (Warning or Down) after the traffic volume per summation period exceeds these limits. By default, no limits are set. Interface Bandwidth, kbit/s – specifies the target network interface bandwidth. 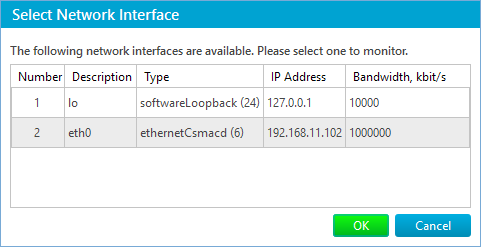 An SNMP request used to get an Interface Name also returns the interface bandwidth used as the default Interface Bandwidth value. This value can also be set manually. The Measure traffic and show it as parameters have the same meaning as described for the WMI Traffic Speed Monitor. Credentials – section has the same meaning as the similar SNMP Custom Monitor section. The Interface Name and Interface Bandwidth, kbit/s parameters are the same as the SNMP Traffic Speed Monitor parameters. The Measure traffic and show it as parameters are the same as the WMI Traffic Volume Monitor parameters. Note: Volume Limits can be set on the monitor State condition tab. A monitor will switch to a problem state (Warning or Down) after the traffic volume per summation period exceeds these limits.